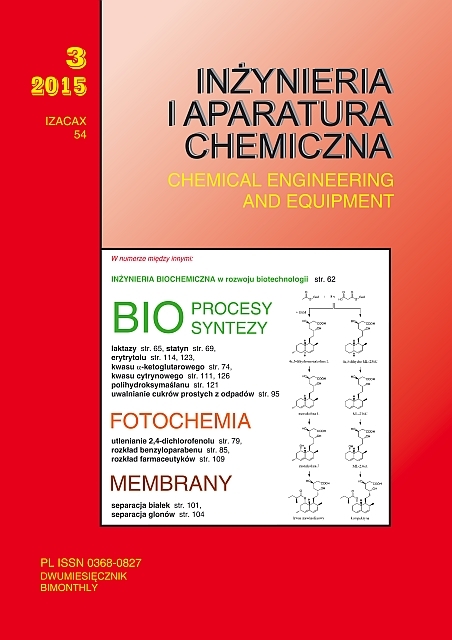 This work presents the newest achievements in biochemical engineering and its contribution to development of biopharmaceuticals and biosimilars worldwide as well as in Poland. The progress in this field are presented separately for the individual stages of the bioprocess: upstream processing (USP), process in bioreactor and down-stream processing (DSP). There is a need for integration of these stages in particular when the bioprocess is performed continuously. The influence of aluminium oxide particles in the culture medium on laccase biosynthesis and fungal morphology was studied. The results show the positive effect of microparticles at all tested concentrations of aluminium oxide. The concentration of 15 g/l was selected as the optimal one because of high laccase activity and complete incorporation of aluminium oxide to biomass. The higher concentration of aluminium oxide caused the decrease in pellets size and their surfaces got more hairy up to transformation into dispersed morphology at the concentration of 30 g/l. The use of the Microtox® test for toxicological evaluation of water samples containing selected priority substances and pharmaceutical compounds subjected to the photolysis process is proposed in the paper. The results indicated that during UV irradiation toxic by-products of their reduction were generated. Those products deteriorated the quality of treated water. It was also found that a degree of removal of tested compounds depended on the compound nature and time of UV irradiation. Statins are chemical compounds used as cholesterol-lowering drugs. In this study, a catalogue of statin-type molecules produced by two strains of filamentous fungi in liquid media containing saccharose and yeast extract was investigated. Monacolin L and mevinolinic acid (lovastatin) were detected in the Aspergillus terreus ATCC 20542 culture, while in the culture of Penicillium solitum CBS 288.36 the metabolites ML-236C and ML-236A were identified. The metabolic profile of P. solitum in the liquid culture was different from the profile described previously for agar-based cultures. On the basis of DEM method computer simulations of silo discharge process were performed and the effect of particle shape for three plant materials on local porosity profiles in selected characteristic regions of a model silo were investigated. The obtained various types of powder motion allowed the formulation of new dimensionless criterion for a quantitative assessment of powder flow type to be proposed on the basis of local porosity course during the model silo discharge. Nowadays α-ketoglutaric acid is produced via expensive chemical synthesis, although it is also possible to obtain this acid via microbial biosynthesis. The aim of presented study was to select the nitrogen source, thiamine concentration and pH of the medium for efficient α-ketoglutaric acid production from glycerol using Yarrowia lipolytica A-8 strain. The substantial effect on the productivity of presented process had the thiamine concentration and pH of fermentation medium. In optimal conditions the strain A-8 produced 38.5 gL-1 of α-ketoglutaric acid with the yield of 0.39 gg-1 and volumetric production rate of 0.53 gL-1h-1. An appropriate purification method of bacterial bioflocculants was selected and flocculating activities of studied strains were compared. Studies showed that bacterial strains from Actinobacteria can synthesise bioflocculants with high flocculating activity which is very stable during purification process. The high activity of isolated biopolymers will enable their efficient application in industry and medicine. Chlorophenols are toxic water contaminants. Existing methods of water purification are not able to degrade them. Photosensitized oxidation process permits to remove aqueous pollution using visible light. The results showed that application of Xenon lamps (as a Vis light source) is energy consuming. However, when the sunlight will be used as a light source the energy cost is negligible. Moreover, results showed that energy necessary to initiate the process is quite low and the process can be led by the Sun as a light source. It can be concluded that photosensitized oxidation process can be conducted with the use of solar radiation in Polish conditions. The experimental results of entrainment of drops deposited on the filters designed for filtration of liquid aerosol (mist) during normal operation of filters are presented. The influence of the average fiber diameter of filter on the amount, distribution and average diameter of droplets entrained from the filter was investigated. It was observed that the increase of the average fiber diameter of filter led to the decrease of amount of droplets observed in gas stream leaving the filter and the increase of average diameter of droplets. The degradation of benzylparaben in water solution using photolysis photosensitized oxidation was studied. Studies were conducted to examine possibility of application of singlet oxygen generated via excitation of immobilized photosensitizer into insoluble polyurethane nanofabcrics by visible light for reducing the toxicity of reaction solution. The experiments showed that despite the low mineralization obtained after 180 min. of treatment, the toxicity of reaction solution was reduced. A batch biotransformation process running in the presence of microorganisms cells revealing a specified enzyme activity was considered. The parallel deactivation of enzyme was taken into account. Based on variational calculus computations the optimal temperature conditions ensuring minimum duration time were determined. It was proved that the application of microorganisms cells results in slowing down the reaction rate and shifting the initial temperature of stationary profile to higher values. They are more pronounced when the lower is the permeability of membrane cell. In consequence, the extension of process duration time is observed along the sections of optimal profile while the lower temperature constraint usually becomes inactive. Catalase is the enzyme having useful applications in textile, food processing and pulp and paper industry for removing a hydrogen peroxide residuum. Abovementioned process is carried out usually under isothermal conditions. Such conditions can cause faster enzyme deactivation. In this paper the optimal temperature control was presented accounting for not only deactivation caused by the substrate but thermal deactivation of catalase as well. It was proved that the effect of thermal deactivation of catalase in the bioreactor design may be neglected. In this paper a hydrodynamics of two-phase flow of liquid-liquid mixture in a microchannel is discussed. The local volume fraction of dispersed phase was compared with the inlet volumetric quality of the same phase. A non-homogeneous flow and the slip of dispersed phase were observed for each experimental data. The correlation equation proposed in this work is the best method describing experimental data concerning dispersed phase in liquid-liquid flow in microchannels. 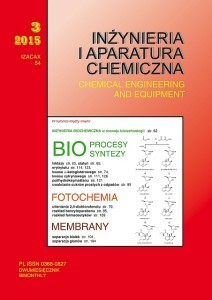 The aim of the presented work was to examine the applicability of selected agri-food industry waste materials as substrates for microbial hydrolytic enzymes biosynthesis (mostly celulases, xylanases and poligalacturonases) as well as to determine the quantitative and qualitative composition of mono- and disaccharides released from non-starch polysaccharides. (sucrose, glucose, galactose, fructose, cellobiose, etc). Two strains of Trichoderma fungi were tested: T. citrinoviride C1 and T. harzianum T33 in SSF culture on six diffe-rent waste materials from agro-food industries (pulp from: cherries with seeds, pears, red cabbage, cornelian cherry and grapes with seeds). The current study was separated into two parts: experimental study of temperature impact on activity and stability of immobilized β-galactosidase and preliminary modeling of changes generated in alginate-Ca2+ matrix with respect to temperature using molecular dynamics approach. On the basis of obtained results it can be stated that combination of experimental research and computer simulations on molecular level provides an additional insight greatly enhancing capabilities to control and optimize the process using immobilized biocatalyst. The aim of this research was to elaborate the effective method of whey utilization. Whey is a very dangerous by-product from the environmental protection point of view. A first step of this process was a valuable protein recovery using membrane techniques. After that, as a second step, there was peptides recovery obtained from whey proteins hydrolysis. Ceramic membranes were involved for that purpose. Micro- and ultra-filtration membranes were used for proteins recovery, whereas an ultrafine-filtration membrane was used for peptides separation. The experimental results lead to the conclusion that a ceramic membrane cascade can be used for the whey utilization process. The paper presents an analysis of dehydration methods of algae biomass and separation methods of metabolites from this biomass. The application of membrane biomass filtration is shown. It was found from literature that due to the complexity of interactions between biomass and membranes, there is a high risk of bio-fouling tended to form a cake on the membrane surface. Therefore, it is possible to use only the cross-flow filtration supported by membrane surface potential and electrical charge of feed ingredients. The powder form of keramsite (expanded clay) oryginated from the sorting process of Leca® KERAMZYT coarse aggregate was selected as research material. The analysis of powdered keramsite (d < 200μm) properties led to conclusions that physicochemical characteristics − size distribution, density, large porosity, surface area and specific sorption properties indicate the validity of its use in the activated sludge technology and improvement of phosphorus removal from wastewater. The keramsite powder form represents mineral material, slightly alkaline, from which there is no leaching of hazardous substances into the aquatic environment. The aim of this study was to determine the susceptibility of two pharmaceuticals, i.e. diclofenac (DCF) and sulfamethoxazole (SMX) for decay by means of artificial sunlight. The study was conducted for different irradiation intensity. The obtained results show that the investigated substances are prone to the photolytic degradation, however, DCF was more efficiently degraded in these processes. According to the obtained results, the kinetic parameters of photolytic reactions were determined. The calculated values of pseudo first order kinetic constants of these reactions varied in the range from 0.09 h-1 (SMX, irradiance = 250 W/m2) to 2.95 h-1 (DCF irradiance = 1000 W/m2). Yarrowia lipolytica reveal the ability to grow on fats or paraffins and they metabolize a few sugars, ie. glucose, fructose and mannose. They do not have the ability to hydrolyze sucrose – a main component of molasses. In this work Y. lipolytica transformants with cloned invertase from yeast Saccharomyces cerevisiae were used for efficient production of citric acid from molasses in bioreactor batch cultures. The A18M strain produced 21.8 g/L of citric acid with the yield 0.48 g/g and productivity of 0.8 g/L/h. The aim of this study was to examine the impact of nitrogen source on production parameters and the activities of enzymes involved in the erythritol biosynthesis from glycerol using Yarrowia lipolytica. The high concentration of erythritol and the high yield of its production in the culture with peptone were correlated with the highest activities of enzymes responsible for the glycerol assimilation. A slightly lower erythritol concentration and its production yield at high productivity was obtained in the cultures with inorganic nitrogen source. Moreover, in such conditions the activities of transketolase and erythrose reductase were the highest. Experimental studies on hydraulics of froth co-current column were performed. Gas and liquid real residence time in the froth was determined. Gas and liquid interfacial area was approximately calculated. Gas pressure drop across the dry and wet shelf as well as in the froth layer were measured. The presented column due to its advantageous features, i.e. relatively large gas – liquid interfacial area and stable work under high wetting density should be applied in industrial mass transfer operations. The paper describes a method of immobilization of AEBSF synthetic protease inhibitor which belongs to the family of benzensulfonyl compounds. The application of capillary electrophoresis for a quantitative analysis allows one to perform high-speed measurement characterized by high specificity and repeatability. The obtained results allowed one to confirm that the AEBSF inhibitor under covalent immobilization process is effectively bound to the porous support. It was also determined that AEBSF inhibitor binds to the matrix by adsorption and hydrophobic bonds. The production of polyhydroxybutyrate (PHB) by Cupriavidus necator in a synthetic and natural medium in shake flasks was investigated. It was found that most of PHB in bacterial cells (62.0%) was obtained in a synthetic medium containing sodium butyrate at the concentration of 5 g/dm3. The thermogravimetric analysis of C. necator showed the clear separation between the thermal degradation of PHB and other components of bacterial cells suggesting the possibility of its usage for the determination of PHB in the cells of microorganisms. The aim of this study was to examine the effect of increased osmotic pressure caused by different salts addition on erythritol production from glycerol by Yarrowia lipolytica yeast and on the activities of enzymes responsible for biosynthesis. In bioreactor production cultures the presence of salts stimulated activities of transketolase and erythrose reductase, resulting in increased formation of erythritol and its production parameters. The best results were achieved in the culture with 4.5% CaCl2, where 85.7 g/L of erythritol was produced with the yield of 0.56 g/g and productivity of 113 g/(Lh). The aim of this study was to examine the production parameters of continuous citric acid biosynthesis from glucose by Yarrowia lipolytica Wratislavia 1.31 yeast in dependence on the nitrogen source concentration. On the basis of three 700-hr cultivations performed in media containing 2, 4 and 6 g/L NH4Cl, it was confirmed that concentration of nitrogen source influenced the efficiency of continuous biosynthesis of citric acid from glucose. The best results were achieved in the process with 4 g/L NH4Cl where yeast produced 90 g/L of citric acid with the productivity of 1.18 gL-1h-1 and specific production rate of 0.045 gg-1h-1. Baker's yeast cells due to the high content of intracellular enzymes are used as biological catalysts of chemical reactions. Permeabilization process with the use of alcohol can significantly increase their effectiveness. On the basis of the corresponding mathematical models the simulation of effectiveness of permeabilized baker's yeast cells for predefined temperatures was performed. The results of analytical calculations allows for easy prediction of intracellular catalase activity for the imposed temperatures. The paper presents production of enzyme which degrades some hemicellulose form. The protein was produced by a genetically modified strain of E. coli in the microbiological reactor. The optimal conditions for protein biosynthesis process were indicated. The reaction rate constant was determined for the purified preparation. The enzyme stability was evaluated as a crucial operational parameter for potential application in the hydrolysis of plant biomass components in a large-tonnage process.